← My Oga At The Top ……Bane of Nigeria? Just as Twitter celebrated its seventh year last week by reeling out amazing numbers of subscribers, Twitter Nigeria marked the week with a show of robustness evident in the world-wide trending of the hilarious tweet fight between us and Kenya. Twitter might be 7 years old (established March 21, 2006), and Nigeria a somewhat late adopter but its popularity and influence is on the rise with each passing day that it is foolhardy for anybody to ignore it. In the Nigerian social media sphere, Facebook certainly still has the numbers but Twitter is now the pulse of the nation. Twitter was set up 7 years ago by Jack Dorsey and his pals at Odeo. It did not have the classic start-up tradition of an Ivy League university campus or dad’s garage; instead it stole in under the limelight – just an SMS service to communicate to a closed group of people. Slowly but surely, the numbers kept rising until Twitter became the bane of governments, inspiring revolutions across the middle east, redefining social engagements, changing the face of PR and marketing, spawning the era of self-promotion, affecting diplomatic entente, empowering the middle class, agitating the ruling class and re-energizing social media all in 140 characters. Like I said earlier, Twitter was slow in gaining popularity in Nigeria. A combination of low internet penetration in the mid to late 2000s, the supremacy of Facebook and the initial difficulty of mastering Twitter by first timers were the probable causes. But times have changed. The ubiquity of smart phones and Blackberrys, cheaper internet access and the fad culture has turned Nigeria into a “Twittering” giant. But most importantly, the Arab Spring, fueled by Twitter and Facebook, inspired Nigerians to stage a Twitter propelled Fuel Subsidy removal revolt and bring Twitter to the big party. Before the Fuel Subsidy demonstrations of January, 2012, Twitter was gaining followers across the nation as an alternative to Facebook. But the subsidy demonstrations was like a shot in the arm as citizens, especially young people, sought to follow proceedings even after the nation had been shut down by labour strikes. The flexibility and immediacy of dissent in 140 characters was both refreshing and unique and the platform saw a surge in numbers. Since then the Nigerian Twitter space has become emboldened with arm chair critics, keyboard pundits, self-appointed ombudsmen, political “twitternauts,” government propagandists, customer care handles, egotistic celebrities, comedians, opinionated bloggers (read me), “wannabee” teenagers, the good folks who beat Kenya in that Tweet fight and an ever ranting Odemwingie. The Nigerian Twitter space has moved from the margins to centre spread. It now dictates the agenda, has become a certain kind of “gallup poll” or vox populi if you like, and is now the number one destination for news. No wonder a couple of weeks ago, Google shut down its RSS services. When Goodluck Jonathan won the presidential elections in 2011, his Facebook page was the centre of his social media campaign; today Twitter is, as his media specialists battle opinions, ideas and opponents with active Twitter handles. The preeminence of Twitter was established last week when the Ministry of Foreign Affairs had to summon the US envoy to explain certain Tweets which the government found inappropriate. The meanness of Twitter was exposed a fortnight ago when the careless gaffe of the Lagos Commandant of the civil defence corps led to him being unashamedly pilloried. On Twitter there is a saying that while Facebook is like a little town where everyone knows each other, Twitter is like New York, the big, crowded city, where to make it, ‘you gotta work hard.’ Twitter Nigeria is a cerebral sphere. The conversation is intelligent and meaningful. Yes, divisions are still evident. But the pulse is of a young, proud demographic, frustrated with the pace of progress, yet fiercely protective of the motherland. Ask the Kenyans. Archimedes once said, “Give me a point to stand on and I’ll move the earth.” I say, just 140 characters, sir. This entry was tagged 7 years, Facebook, Goodluck Jonathan, Jack Dorsey, Kenya, Nigeria, Odemwingie, Odeon, Twitter. Bookmark the permalink. I love that picture. It is very evocative. 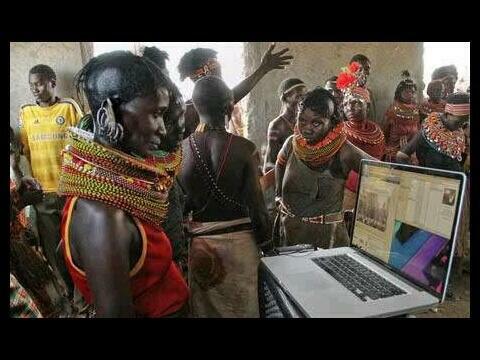 Something westerners associate with high technology being used by a person that westerners would see as primitive. I love it. It breaks the barriers. Well done.